We are pleased that you’ve chosen the safest existing Internet messenger. 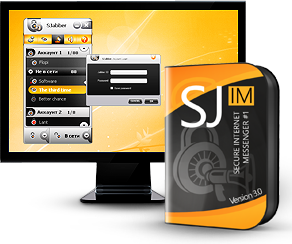 Please note that you are not simply buying a Jabber client with a built-in automatic PGP encryption; you’re purchasing an IM (instant messenger) that supports JABBER, Facebook, VKontakte, Ya.онлайн, ICQ, Miranda, QIP and any other clients based on XMPP (JABBER) and OSCAR (ICQ) protocols. The activation key will be sent to this e-mail. Make sure that THIS IS THE KEY required by SJ, otherwise the system won’t work. You must posses your own PGP key in order to purchase a license. If this is not the case, then download SJ IM and generate a PGP key with it. Here you can find further information on where in the program you can find your keys.